As your business continues to grow and evolve, it's hard to ensure your network can reliably support the changing demands and support new IP-based technologies. 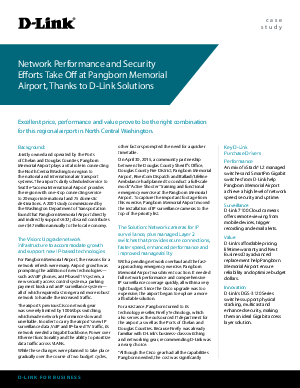 Yet, Pangborn Memorial Airport found that using D-Link as their vendor allowed them to achieve a high level of network speed, security and uptime. Learn how you can easily setup your core infrastructure to ensure reliability and a customizable integration based on your company's unique requirements.